Many tens of thousands of products were manufactured by the various DeArmond companies over more than four decades. In order to verify the date of manufacture for guarantee purposes, some products had their production date (day, month and year) rubber-stamped or handwritten internally during manufacture. The date format was mostly Month/Day/Year, as shown below. The rubber-stamped items included FH pickups and effects pedals. A rubber-stamped Hershey Bar pickup, clearly Month/Day/Year. A rubber-stamped Hershey Bar pickup, Month/Day/Year. 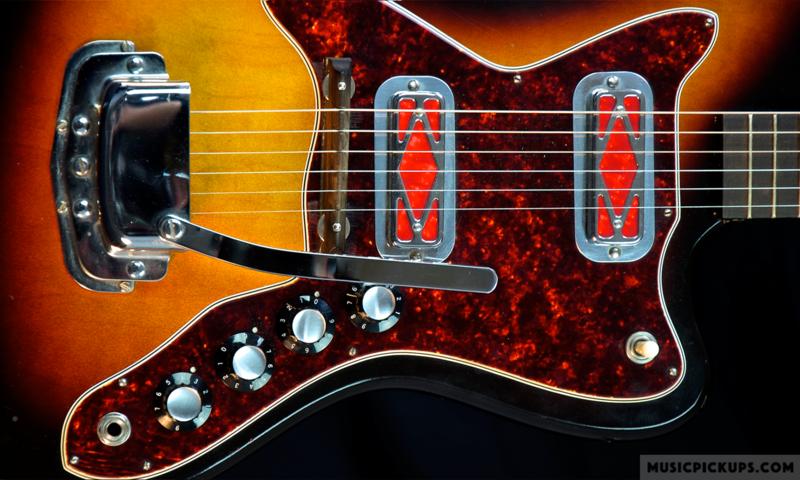 Other products, including some Model 1000 and 1100 Rhythm Chief pickups and ‘Hershey Bar’ pickups, had the same information rubber-stamped on their underside. Some FH pickups had the last two digits of the year of manufacture stamped on the small metal tab normally covered by a black plastic sleeve. The FH pickup’s cover can be removed easily with some care, as it is a push-fit and not soldered or glued in position during assembly. The Company name was also stamped on the underside of some products and while not as accurate as a precise date, this at least establishes a period. See Company History page for more information on Company name evolution. A Jensen speaker ref. SP-5403, with rubber-stamped EIA Code 220 (for manufacturer – Jensen), 00 (for year of manufacture – 1960) and 26 (for the week of manufacture). The Electrical Industries Alliance (EIA) was an organisation which operated from 1924 to 2011 to establish a system of codes for electrical products. In addition to the code number identifying the manufacturer, a code for the date of manufacture was included. Sometimes a third code, usually the manufacturer’s batch code, was also included. Pots also showed their resistance value with a code to indicate whether it was linear or log. The code above, 1376128, on a Volume Controller from a Model 40 pickup, shows 137 for the manufacturer, CTS, the year 61 for 1961 and the week of manufacture as 28. The EIA codes which have a relevance for Rowe-DeArmond products mainly include speakers (Jensen), pots (Centralab, Allen-Bradley, CTS and Stackpole) and transformers and are included in the lists shown below.